Imperforate, watermark 82 (swan), engraved. Printed by Perkins, Bacon & Co., London, England, and locally. Scott #4 (S.G. #17 & 18) were issued August 7, 1857, and Scott #2 (S.G. #15 & 16) were issued on February 26, 1858 according to S.G. Scott has 1857 for both. 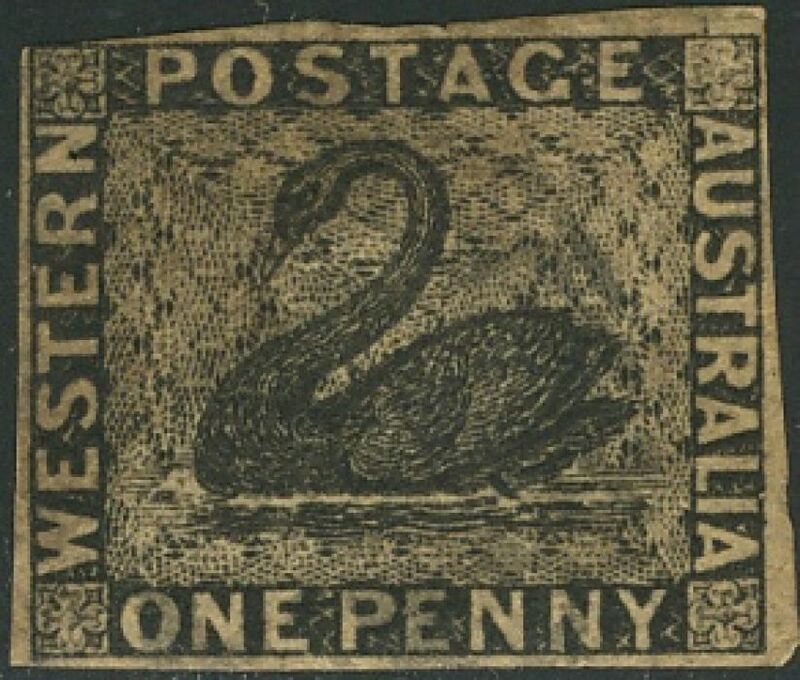 The famous one penny Black Swan is the first Australian stamp with a watermark. On December 4, 1829, the Deputy Harbour Master at Fremantle, Captain Daniel Scott, was appointed Postmaster for the Colony. The first delivery of mail directly from Europe arrived at Albany in July 1852. It took about 83 days for the trip to Britain, a vast improvement compared to earlier. Prepayment of letters became compulsory with the introduction of stamps. We owe a debt of gratitude to Brian Pope of the Western Australia Study Group for his detailed information used in making this page. All issue quantities are due to his generous sharing of information. The one penny black was printed in both London and locally in Western Australia, using the same plate. There's no way of telling the printings apart, since also the paper and ink used was the same. The stamps were printed in sheets of 240 (12 by 20). On June 23, 1854, 30,387 copies of the 1 penny black were destroyed due to being damaged in transit from England. A total of 4,310 stamps are unaccounted for. That could be due to counting errors or, more likely, have something to do with (damaged) copies being used on Department mail. The famous Inverted Frame error is found in the second printing of the 4 pence stamps. It occurs four times in each sheet; 97 sheets contained the error, and therefore only 388 copies were ever printed. Mr. Pope pointed out that of the 4 pence "The first issue was certainly 9,600 Deep Dull Blue." Similarly for the one shilling "The first issue, 1,200 stamps, was certainly Deep Red Brown but some Salmon could have been included"
Of the 4 pence "A total of 272,160 stamps was destroyed prior to 28 October 1871 when 16 sheets were handed over to a Board of Survey." And again, for the one shilling "A total of 41,040 stamps was destroyed prior to 28 October 1871 when 5 sheets were handed over to a Board of Survey." The distribution of printings among the stamps destroyed is not know. The relative scarcity of the stamps can only give us a hint. However, it is often the case that stamps printed first were used first, and therefore relatively few of the first printings have survived. This is especially true for unused stamps. "The fate of the 16 sheets of 4d and 5 sheets of 1/- is not known in detail but some part and whole sheets of each value were dispersed to dealers and officials in the early 1900's and these are the source of most mint blocks. A few were also used up in Presentation Sets. The roulettes and pin-perforated are included in the above totals. It is thought that some could have been made by counter staff at the General Post Office as a matter of personal convenience (this certainly happened later), but the majority of roulettes and pin-perforates were private 'after-issue' productions, hence the huge range of roulette gauges in SG, 7½ to 14. They were done with a dressmakers wheel, readily available in every gentlewoman's sewing kit at that time. My view, and that of the Western Australia Study Group, is that roulettes should never have been given catalogue status but should only have had a footnote. For example, one might well ask the Editor of SG why roulettes are catalogued when pin-perforated, quite properly, are only footnoted given that their status is exactly the same. Unfortunately, the catalogued roulettes are probably here to stay but in our view, they are best ignored and one should definitely not pay a premium for them as they cannot be proven or certified as official issues. Consequently, there is no possible date of issue, or record of numbers made, of any of the roulettes or of pin-perforated." Pope, B., Western Australia: The Introduction of Adhesive Postage Stamps and the Colonial Printings together with the Numbers Received and Issued, 1854-1877. Fagott Press, Claremont, 1977. Hamilton, M. and Pope, B., Western Australia, The Stamps and Postal History. Western Australia Study Group, Perth, 1979. Pope, B., Western Australia: The 4d Lithograph, 1854-1864. Royal Philatelic Society of Victoria, Melbourne, 1984. " Any errors in the presentation are solely the responsibility of the webmaster.